Floors, windows, kitchens, and bathrooms; we have all your corners covered. Lancaster Residential Cleaning Service provides Professional House Cleaning for residences that live in and around Lancaster, PA.
We pride ourselves on the decision to NOT cut corners when cleaning a home. Details are of the utmost importance in our line of work! From carpets of all thickness, to floors of all textures, we have the Staff, Resources, and Knowledge to Properly and Efficiently clean your home from top to bottom. It's never a bad time to call! We offer Free Estimates, which allows you shop around; but we are sure your expectations will not only be met, but exceeded with Lancaster Residential Cleaning Service. See why people are calling Lancaster Residential for their house cleaning needs. Call us today at (717) 208-8807 - or send us a message using the form on the right. From our Heart, to your Home. 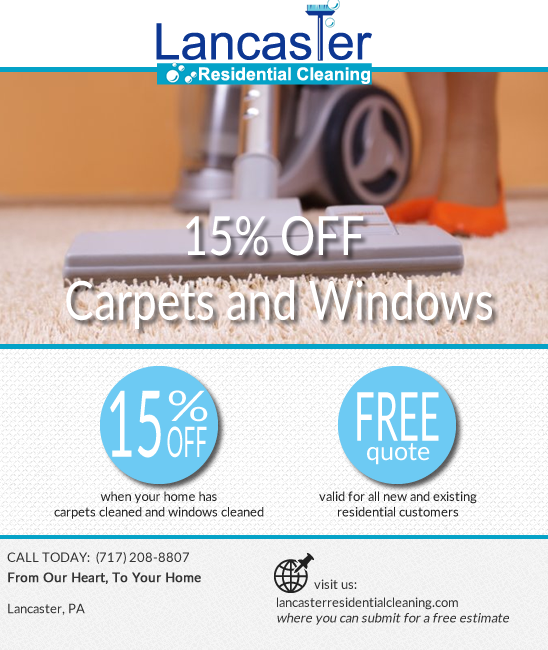 At Lancaster Residential Cleaning, we are proud to offer a wide variety of services for your home. We all know that a clean home is a happy home, but not everyone has enough hours in the day to keep a home clean. Decades ago, the woman of the house worked at home. We had door-to-door vacuum salesmen, but no real need for Home Janitorial Services. Today, in 21st Century Lancaster, PA, much has changed. What was the norm 50 years ago, is simply not today. The role of "homemaker" and "housekeeper" has taken on new traits and new meanings. And although we honor and respect those men and women who have made the important task of "homemaking" a life, we understand that, for many, that task isn't feesable. We offer to you the Finest and most Reputable House Cleaning Service in all of Lancaster County. Lancaster Residential Cleaning Service has been making homes sparkle for years, and we do it with love because we care about what we do. Services with You in Mind. When it comes to Maid Services, we are the "go to" people in Lancaster. We know what were doing and how to properly do it. When we offer cleaning services, we want you to understand that all services are tailored specifically to your needs. Cleaning all floors, or cleaning specific rooms, we clean just as you wish. We understand how important it is to hire the right Maid Service for your Home in Lancaster. You want to be able to trust that your Lancaster Maid Service is properly Cleaning your Home, with the best techniques possible. We strive to be the Best Maid Service in all of Lancaster County! We continually train our House Cleaners so that you know without a doubt that they are providing the best value for your hard earned money. We are a Local, Family owned and operated House Cleaning and Maid Service right here in Lancaster, PA. We love our community and work hard to provide the best Cleaning Service for all of great People in Lancaster. Whether you need a One Time Deep Cleaning or Weekly House Cleaning, our Lancaster Maid Services will make your Home sparkle. Call us today for a FREE Quote or fill out the form on this page.